I know what you’re thinking, what the heck is a jicama? He doesn’t look like much, I know. But he’s really something else. 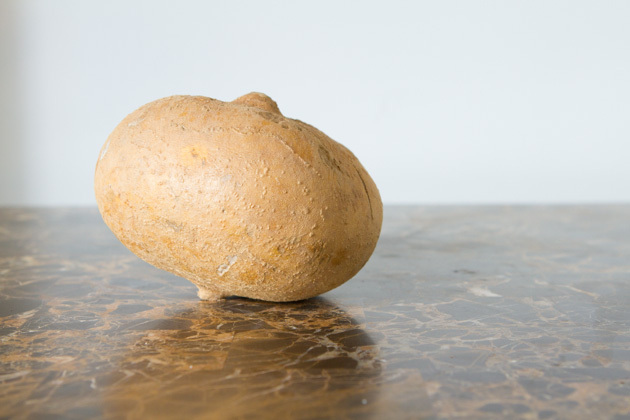 Jicamas have a crisp texture and fruit-like succulent, sweet-starchy taste. Like a potato, with WAY less starch. 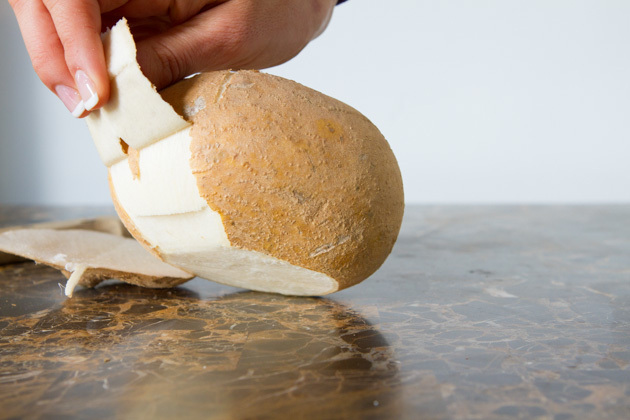 Jicamas are delicious raw, are low calorie, high in fiber, water and vitamin C. Plus, they are delicious raw. I’ve walked past the jicama display numerous times at the grocery store because; to be honest, he’s a bit on the ugly side. And (secretly) new vegetables scare me a wee bit. 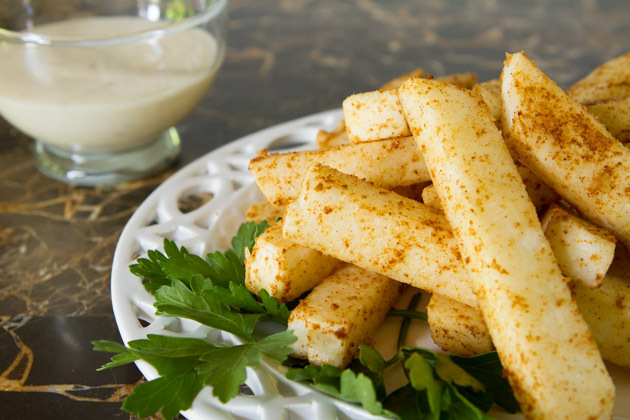 But then I had jicama fries at Greens & Proteins in Last Vegas a couple of weeks ago and, instantly, that ugly, brown, potato-like vegetable didn’t look so appalling anymore. And hey, there is something super awesome about fries that are ready in just 5 minutes, no? 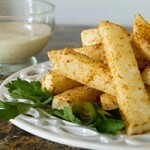 Ultra easy fries made of raw jicama, a tuberous root that's really similar to a turnip (but way tastier). 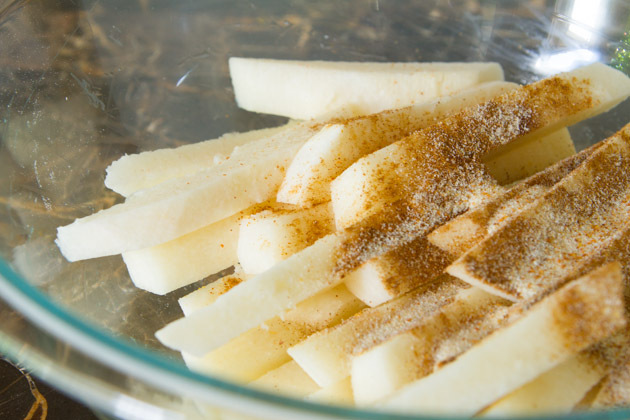 Toss all ingredients together in a large bowl until fries are well coated. Enjoy! 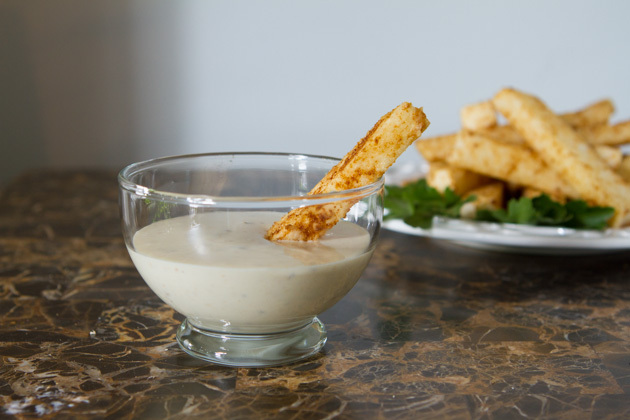 Serve your fries with a batch of my Dairy-free Ranch Dressing for extra goodness. For a baked option, bake at 400F for a total of 25 minutes, rotating halfway through. For the paprika, you could try smoked paprika if you're not too fond of spice. Otherwise, use ½ teaspoon to ¾ teaspoon if you don't want it too spicy. 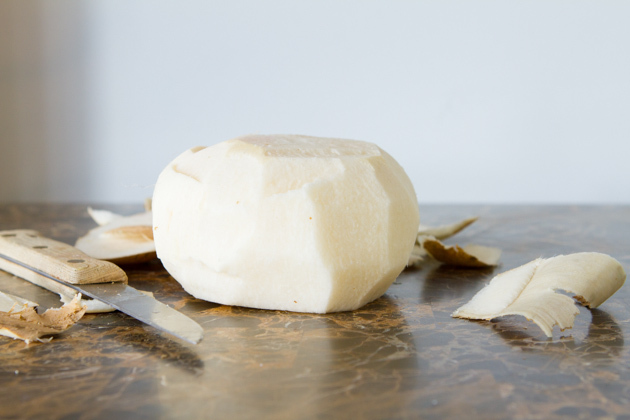 Unlike other root vegetables, the skin on the jicama cannot be consumed. What really surprised me? The skin can be peeled off… like bark from a tree. You just make a little slit at the top and start peeling with your hands. You can remove the skin with a knife, but peeling is pretty fun. 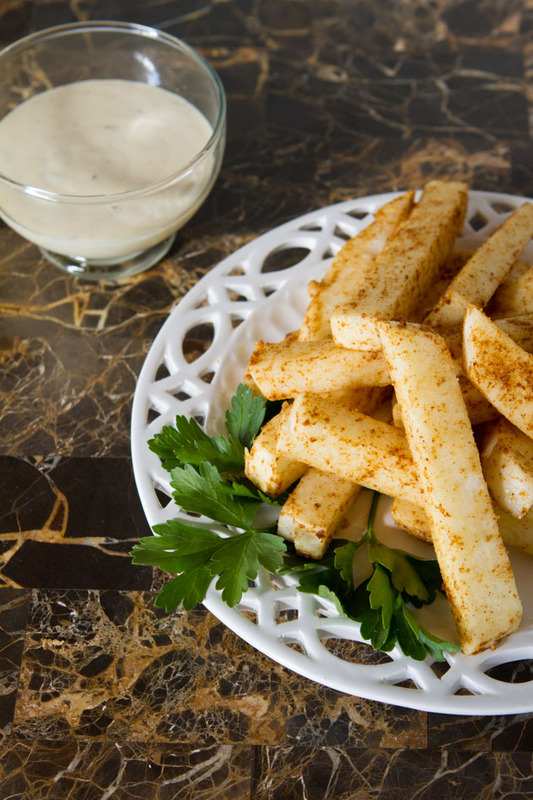 Once your jicama is bare, slice it up into fry-like sections, toss with spices, and you’re ready to chow down on a batch of fresh, raw, good-for-you, fries. And it wouldn’t hurt to serve up your fries with a little batch of my Dairy-free Ranch Salad Dressing. It makes the jicama SHINE. The only thing I’m a bit confused about is whether or not a jicama is considered “paleo”. If any of you want to weigh in on it, I’d love to start the conversation! It sounds like jicama is NOT part of the nightshade family, so that’s a bonus. And, depending on the phase of your candida journey, it may be candida-friendly, too. I’m on a roll and would love to try a couple more exciting new vegetables. What vegetables have you been surprised by this summer? Or, what vegetables are you hesitant, scared, or overwhelmed to try out?